The Industrial Revolution of the 1800s changed life in America forever. Urban areas grew quickly and, for the first time, a small percentage of Americans (one percent) controlled 70 percent of America’s wealth. People began seeking change. Many Americans began fighting to solve the problems of widespread poverty, unfair working conditions, crime, and a lack of rights for women, children, and African-Americans. This time became known as “The Progressive Era” because people worked to change society, moving it forward and progressing. African-American men gained the right to vote in 1870, after the Civil War, but women were still not able to participate in elections. 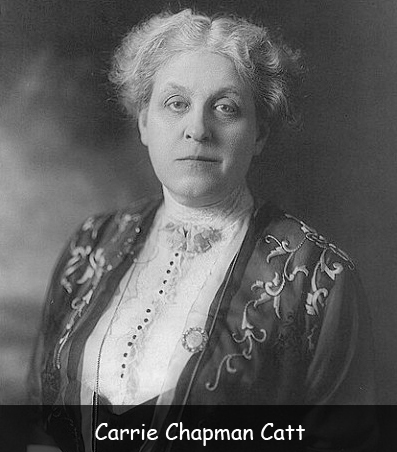 In the early 1900s, women, such as Carrie Chapman Catt, began protesting and demanding the right to vote. These “suffragettes” organized protest parades, which were ridiculed at first. As the movement gained momentum, individual states made it legal for women to vote. In 1920, the Nineteenth Amendment to the Constitution allowed women to vote in all local, state, and national elections. Women soon became outspoken champions of children’s rights, as well. In the 1890s, almost two million children worked in mines, mills, and factories. They worked long hours in dangerous conditions. Union organizer, “Mother Jones,” protested by leading children on a march from Pennsylvania to President Theodore Roosevelt’s New York home. Laws were passed in New Jersey and New York, which limited child labor. Nevertheless, many children continued to work on farms, mills, and in factories. Women also wanted to ban the sale and consumption of alcohol. They were known as “prohibitionists.” They believed that alcohol consumption often led to laziness and violent behavior. In 1919, the Eighteenth Amendment made it against the law to produce or sell alcohol. W.E.B. DuBois believed that African-Americans deserved better work opportunities. His movement gained support after mob violence against African-Americans in Springfield, Illinois. John Dewey, Jane Addams, and other prominent progressive leaders helped DuBois organize the National Association for the Advancement of Colored People (NAACP). Before the mid-1800s, most children were educated at home, by tutors, or in small private or village schools. Poor children often received little education. States began passing laws requiring children to attend school. Question: Were the Progressives successful in changing society? Answer: Many of the laws that were passed during the Progressive Era have made life better and safer for Americans. On the other hand, some would argue that this period began a trend toward more laws and more government intrusion in private life. Visit Scholastic to learn more about the 1920s. Declan, Tobin. " Facts for Kids About The Progressive Era In America ." American History for Kids, Apr 2019. Web. 21 Apr 2019. < https://www.americanhistoryforkids.com/the-progressive-era/ >.